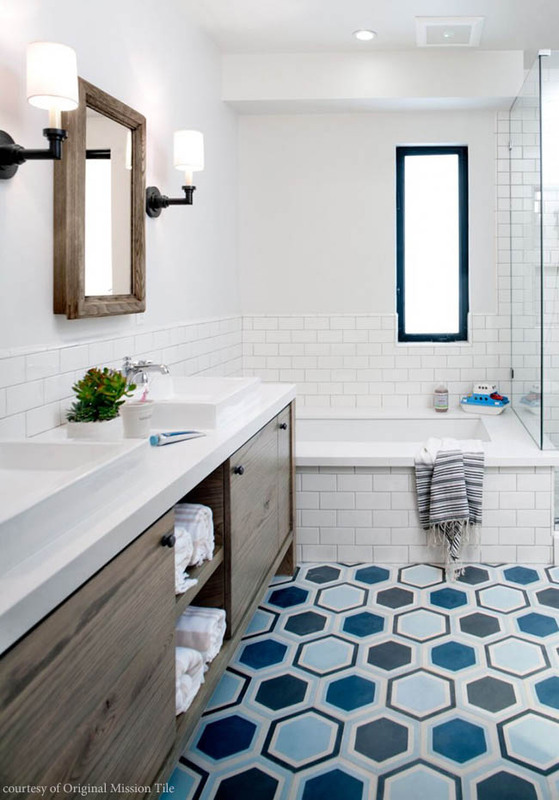 Cemented in Style is bold colors and geometric shapes in tile designs. 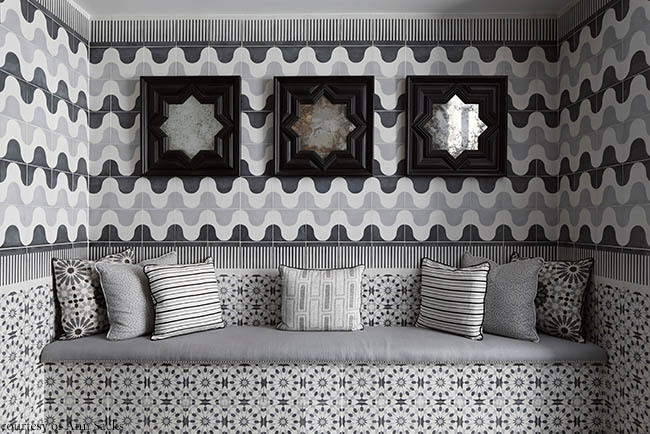 This seating area features Eastern Promise Majorelle and Rio by Martyn Lawrence for Ann Sacks. 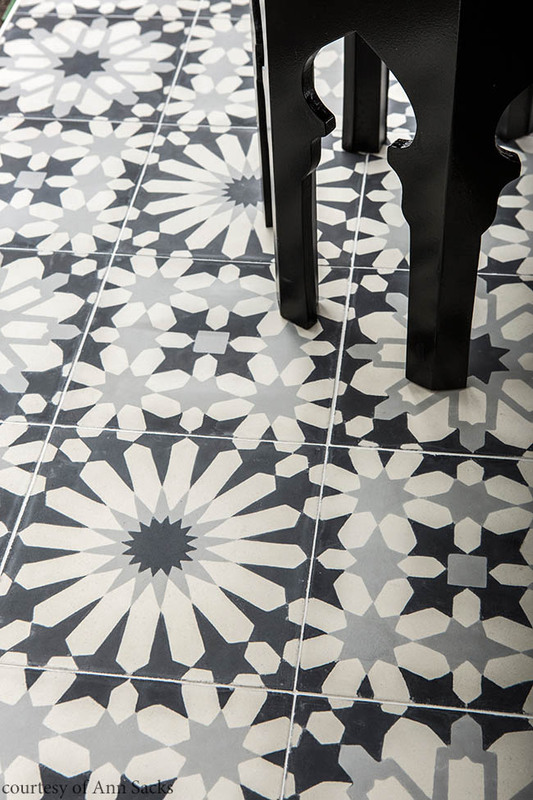 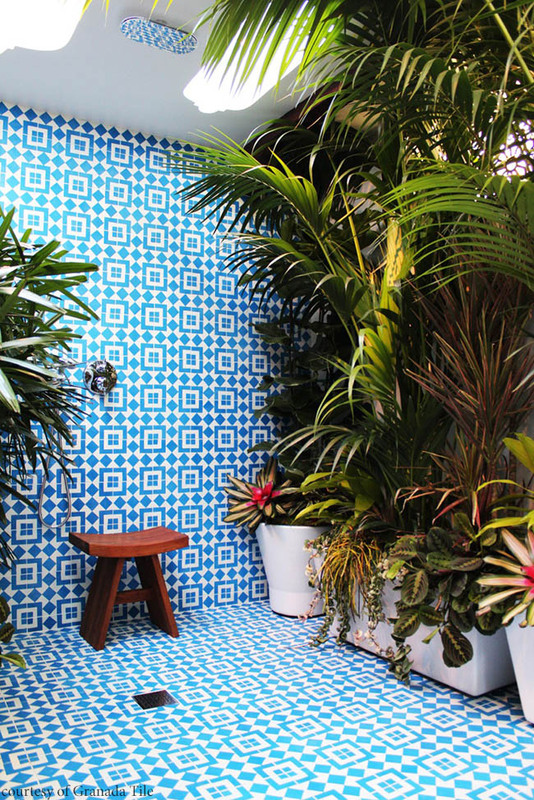 The beauty of patterned cement tile is its ability to complement a wide range of design styles. 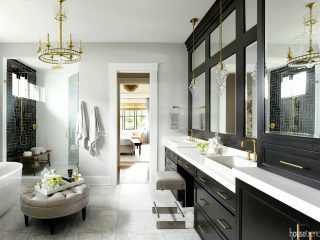 It can create a vintage look in a traditional kitchen, but also establish the perfect focal point in a modern bathroom. 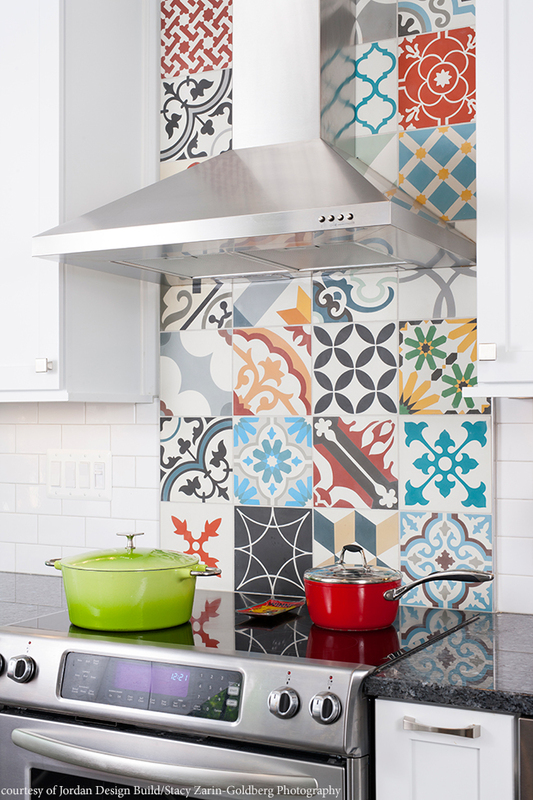 Before you have the first tile installed, it’s important to learn about what you’re bringing into your home. 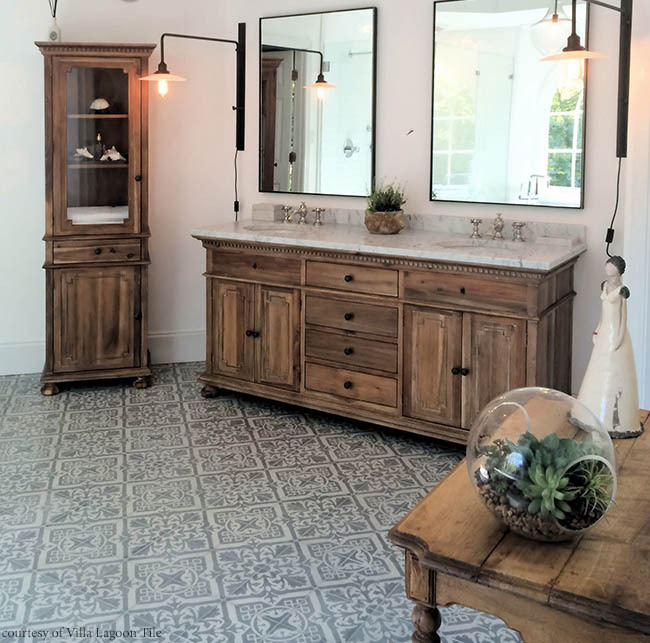 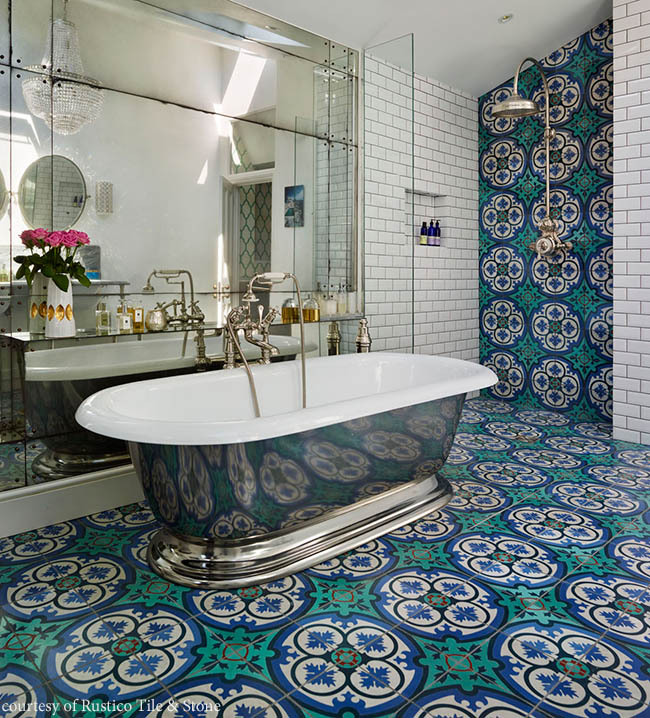 Melanie Stephens, co-founder of Granada Tile, says cement tile has revitalized an art form that developed in France in the mid-1800s. 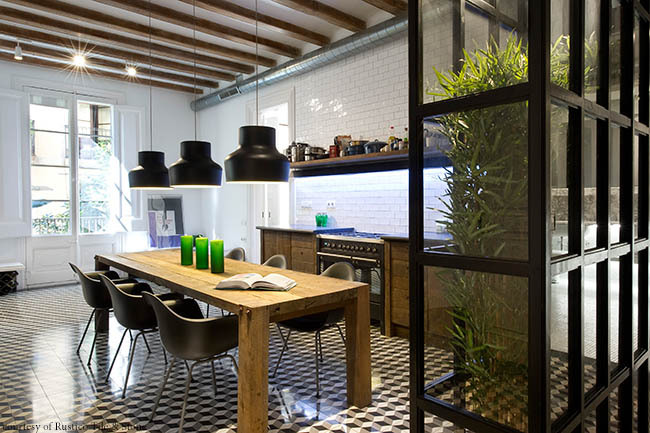 Some even say the true origins of this tile date back to Barcelona. 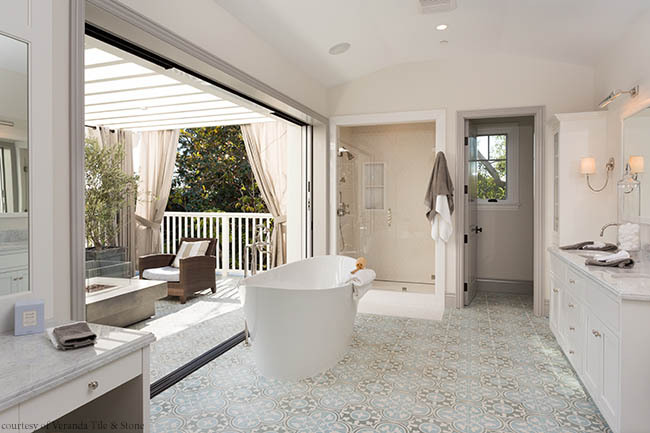 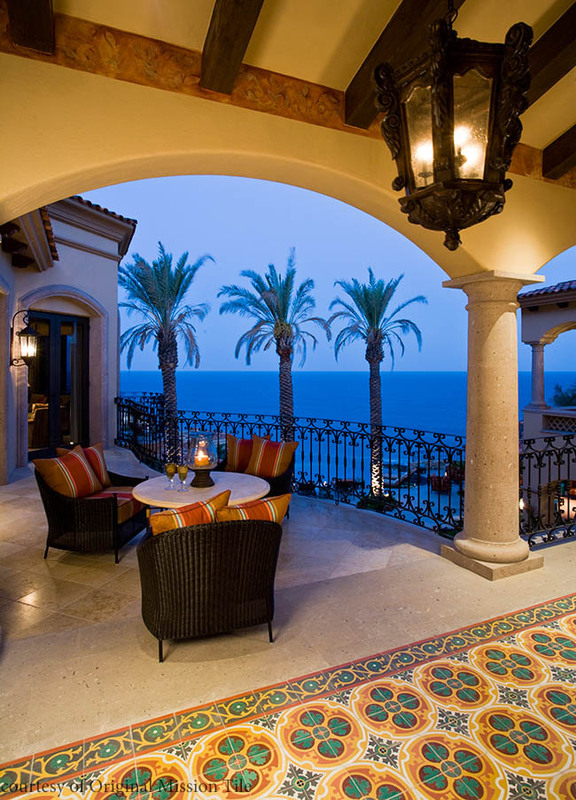 When it comes to the types of tile you are looking for, material makes a huge difference. 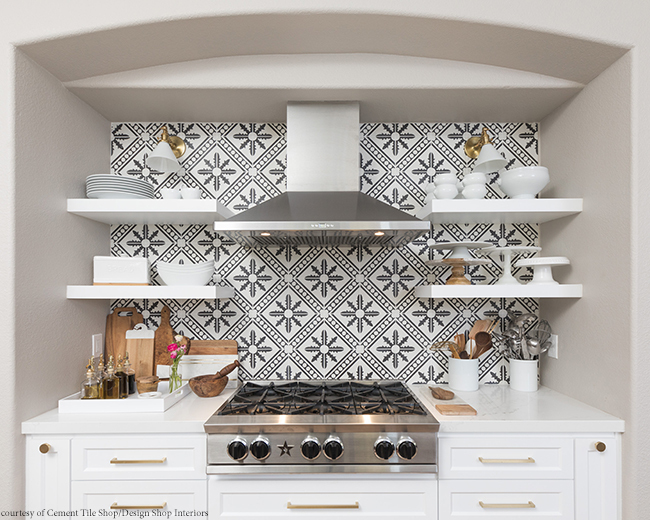 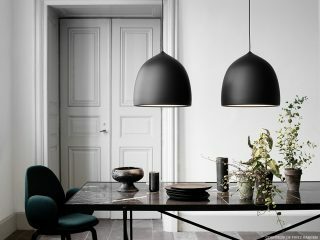 According to Stephens, tiles made with low-grade pigment will not have the same richness and depth of color and those made without marble powder—an important component added to the cement—will not have the same natural luster. 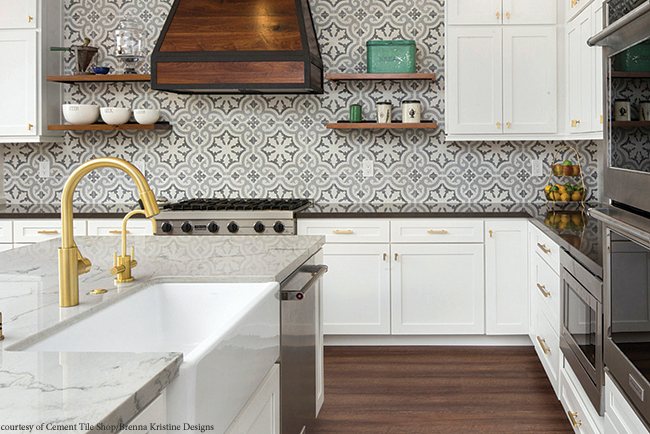 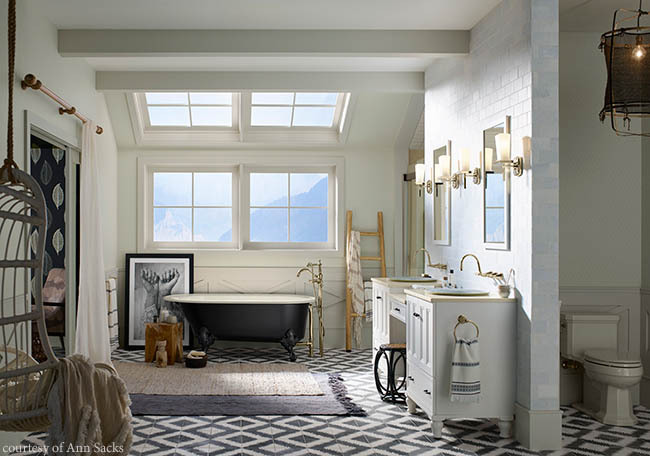 It all depends on the room you’ve chosen to remodel, but if you want patterned tiles and you aren’t sure what room to put them in, Stephens recommends to start with the kitchen or a bathroom. 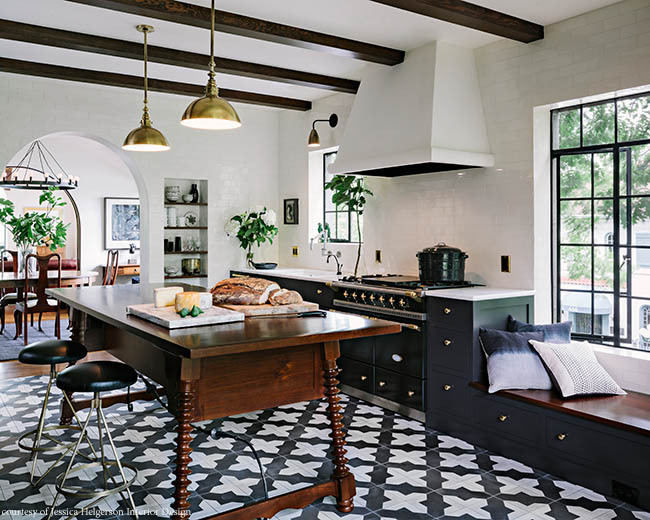 Keep in mind that you are not just limited to flooring—kitchen backsplashes and shower focal points or wall niches are great places to add a touch of character or vintage style. 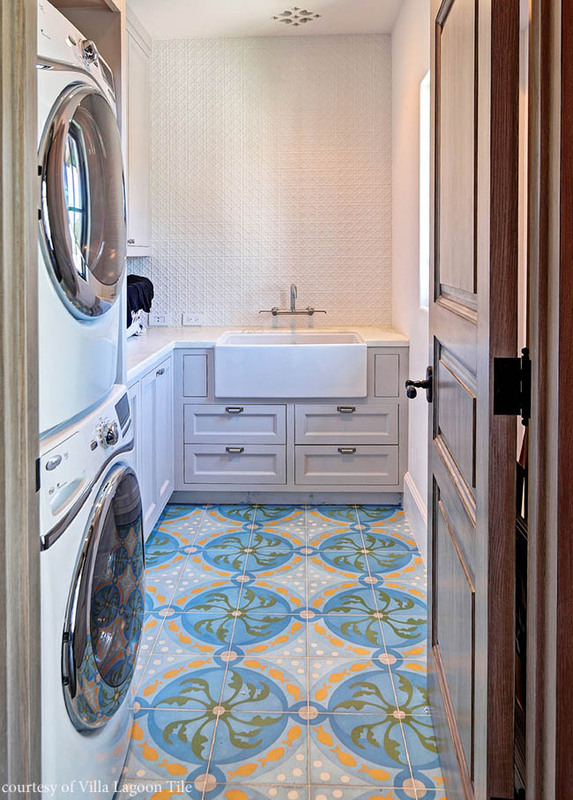 Clamp adds that mudrooms and laundry rooms are great places to experiment. 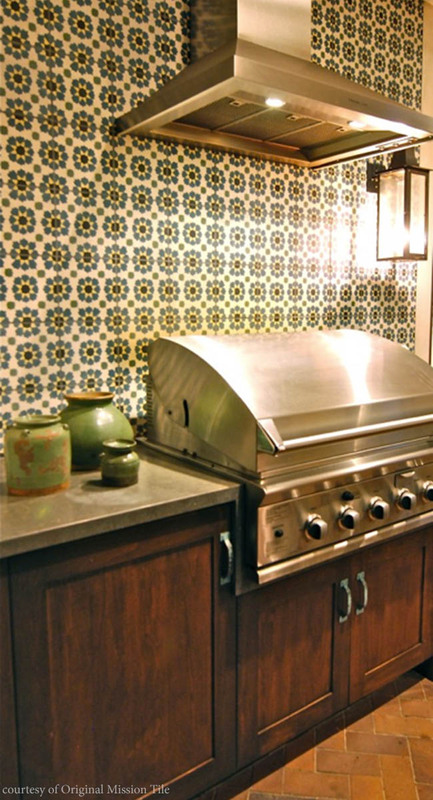 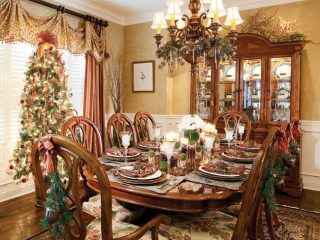 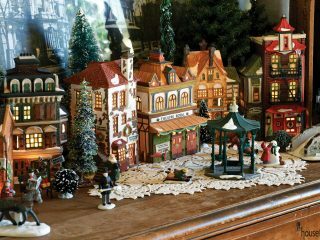 He’s also seeing homeowners use the patterned tile on fireplace surrounds and as accent walls. 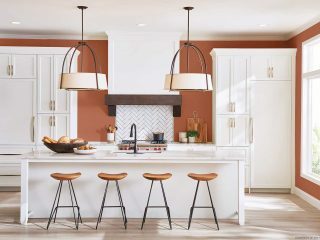 If you aren’t certain about what style to use, Clamp says that classic styles such as florals, geometrics and Moroccan styles are among the most popular.